On the River > Uncategorized > Catch the Wave! If you’ve ever been interested in getting involved with one of the most unique and dynamic events in the area, this session is for you! On the River is seeking the help of a diverse group of people who desire to not only make a difference in their community but also those who wish to have a ton of fun in the sun! This philanthropic summer festival has attracted thousands of people to beach right in the middle of downtown South Bend over the past three years. 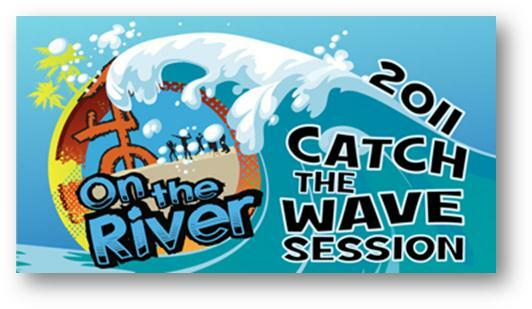 This year, On the River wants you to “Catch the Wave!” Come join us on for snacks, socializing and some information about how you might be able to get involved. Finally, we’d like to be clear that your attendance at this meeting requires no additional commitment; however, at the conclusion of the session you will be given the opportunity to express how you might want to be involved with On the River 2011. We look forward to seeing you soon…summer is right around the corner (kinda)! Oh yeah, and for those of you who just can’t wait until the meeting, On the River 2011 will take place on Friday, August 5th and Saturday, August 6th. P.S. – Please invite your co-workers, friends, neighbors, distant relatives, random kids you see at the mall, etc. We’re looking for teenagers, young professionals, moms and everyone in between. Please just make sure we get an RSVP for everyone who will attend.